Carol is a Burnaby-born musician who has been in the pipe band drumming business since very young. She started at age eight under Scott Robertson and her drumming career has been a steady rise since then. A core member of the Vancouver Ladies Pipe Band, she was part of the band in the 1980’s as it took the Grade 3 world championship in Glasgow, Scotland. As the band moved up into Grade 2, Carol moved into the lead tip position and again was at the forefront as the band competed at the World’s in Scotland during their 1990 Scottish tour. The Ladies also toured the West Coast of the US, Western United States, and more importantly for this writer, visited and competed in Nova Scotia in the early 1990’s. As a young male piper at the Antigonish Highland Games (the oldest continuing highland games in North America), I and many of my Maritime friends fondly recall the visit of the Vancouver Ladies Pipe Band, and the good times in the very large beer tent after the competition. There are few pipers in the Maritime circuit who can’t recall the time a band of piping and drumming single young women from the far extremes of Canada came to our lively Highland Games! In 1991, Carol joined the Triumph Street Pipe Band, Grade 1 playing with them for 3½ years through the Western Canadian and US competition circuit. In 1995, Carol was invited to play with the City of Wellington Pipe Band, Grade 1 in New Zealand during their competition season. There she met and married her husband Alistair, an accomplished snare drummer. She and Alistair returned to Canada in 1998. Carol’s drumming career included the Grade 2 Maple Ridge Pipe Band (now the New Westminster Police Pipe Band). 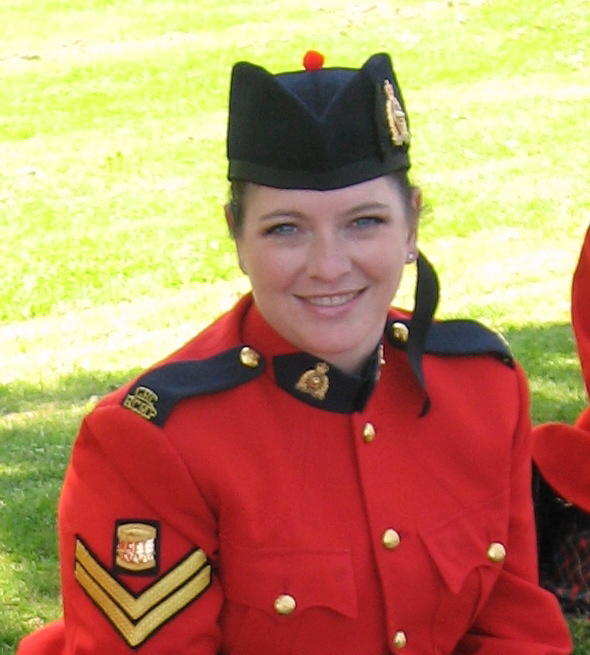 After a short break from competition, the RCMP E. Division Pipe Band was fortunate to have her join in 2006. She now dons the Sergeant stripes on her red tunic and will lead our drum corps as we continue to build the band and refine our music. The entire RCMP E. Division Pipe Band welcomes Carol to her new position, and we look forward to the great music, performances and good times from our accomplished and talented “Vancouver Lady”.